There's a new flower shop in our local town so we tried it out for a Valentine's day bunch. The roses didn't last long, nor did the red daisy things, so Anita freshened up the display with some daffs from the garden. Very nice effect, though I don't think we'll be going back to the florist. I got a new PC the other day, somewhat better spec than the old one that was being replaced, having been damaged by a lightning strike. After two days of work transferring data files and programmes across, looking up passwords, login IDs and software activation codes, it just sits there doing the same things the old one did, just a bit quicker. Kind of disappointing, really. The old one was a Dell, fairly expensive (€1200 or so) in 2011, one of their top end models. The new one is an Acer, under €900, with a better spec, and faster. I have the impression that the build quality of the Dell is better, and the Acer has a non-exchangeable, built-in battery, which planned obsolescence I dislike. Still, it will do the job I need, and hopefully it'll still be good in 5 or 6 years' time, else it will be back to Dell. I have completely gone off the non-portable PCs. Perhaps I could look at those again, but I like the fact that portables don't shut down instantly in a power cut. We get quite a few power cuts here. Transferring files from one PC to another today, I stumbled across these pictures of the roses on full power against the lodge, and a tree lupin elsewhere in the garden. Nice, eh? A hint of Summer to come. I've been installing some raised herb beds next to the gîte kitchen recently. The idea is to take better control over the area generally, and to have some useful herbs within easy reach. There are some bunching onions there, and I'll move some Thyme and Chive plants into it as well. I usually grow some Thai Basil since you can't get it over here, that will go in there too, along with some annual Coriander, Parsley and Chervil. The tree that is just out of the picture on the right is a peach tree near the end of its life. I'll take it out and use the space for a third raised bed. Sometime. Another day, another attempt a keeping fit by walking. It was a bit more difficult this time, owing to the large volumes of wet stuff that have been dumped from the sky over the past few days. 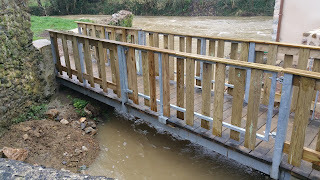 The river was high, the new little bridge by the restaurant actually had water under it, most unusual. 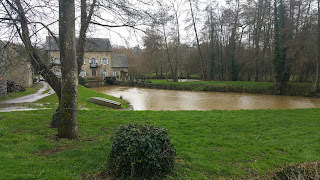 And Le Grand Moulin had some water, despite the bypassing sluice gate being open. 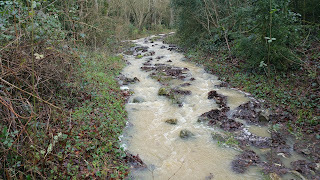 The most difficult part of the walk was the track up the side of the hill that had turned into a rivulet. The water pouring down it paused from time to time to make wide boggy expanses across the whole width of the path. 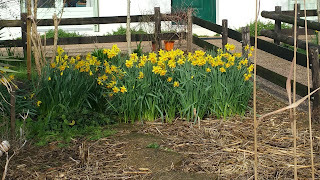 But towards the end, I passed a front garden that proudly announces that it is a butterfly sanctuary, displaying a whole bunch of bright and cheerful daffs. I was feeling a bit in need of some excercise, so I took a short walk outside between showers, to the village. There's an air of Spring, with Primroses and Camelia both in flower. 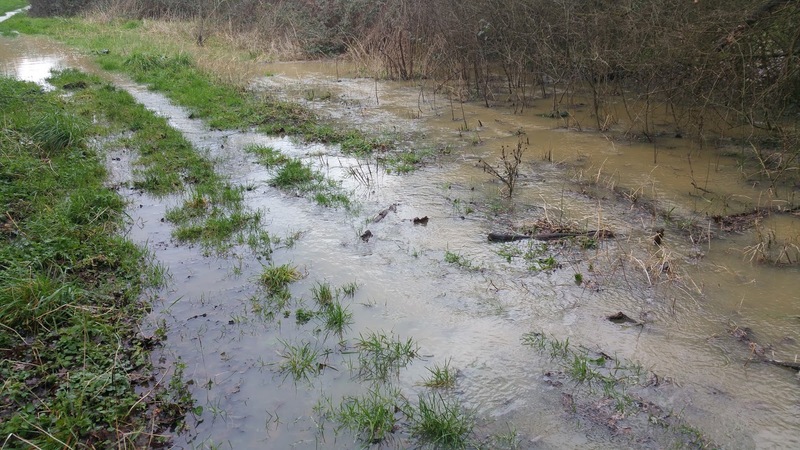 The river is flowing fast, with the sluice gates open at all the little dams, it's intended to clear silt from the river, apparently, and help with fish migration. The trees are budding out already, which gives them a purple haze, and the catkins are on display too. I quite liked this woodstack - very neat, all the logs the same length too. I wonder what they did with the short leftover bits? The tin roof is tied down, so shouldn't blow away. Some neat raised beds too, look carefully made and tended. The maker has raised them a bit higher than I make mine, and I like the way he has joined the semi-round planks that make the sides. Some animals on the way. This is the ex-mayor's donkey, in a field with some little black sheep to keep him company. He will come over to you if he sees you picking the juicy grass just out of his reach on the other side of the fence. And this bull struck me as not the kind to be taking any crap. This sturdy bridge replaces an old rickety one that I crossed once. It had rotten wood, gaps in the planks and a handrail that would give if you leant on it, so the new one is a great improvement. The view back towards the village from the far side of the bridge is sort of rustic and peaceful. Some time around January 2015 I bought an electric jack-hammer, for the bargain price of 215 euros. It came with two drill bits; a sharp pick, and a chisel. The chisel is no wider than the shaft that attaches it to the hammer, and at the time I thought it would be a good idea to get a bit with a wider edge, for cutting into things like tree roots. I spotted one in our local DIY warehouse Leroy Merlin, the right size for the jack-hammer, but if memory serves, it was priced at about 120 euros, that is more than half what I paid for the whole jack-hammer with two bits. The price was not inconsistent with what you could pay on Amazon, but since I wasn't cutting tree roots at the time, I left it. Well there we were in the shop the other day, and the chisel bit was in the clearance sale, 30 euro, marked down from €105, according to the tag. That's more like it. The Restaurant Le Canyon is just down the road from us, and as part of a big renovation / museum construction project, it has been moved into the old mill. It opened in these new premises yesterday and we, along with a bunch of other people, went down to check it out. The restaurant is on two floors, the upstairs being one large room, the downstairs includes the toilets and the kitchen as well as a smaller eating area. The decor is well done, and I liked the hat tip towards the cave paintings, in the form of cut metal representations of the horses there. The atmosphere in the downstairs part is reminiscent of an English tea room, which is perhaps appropriate for a facility that is intended as an adjunct to a museum. The chef, Jean-Claude is very pleased with the new kitchen; he says it's ideal for a single person cooking, and he advised personally on its layout and equipment. The tenant Luigi and everyone else is delighted to see the restaurant featured, on the front page, no less, of a review in Paris Match, of the gastronomy of Le Pays de La Loire. And of course, when you're not enjoying the gastronomy of the Restaurant Le Canyon, you can enjoy the scenery. It's a bit dull at the moment, but then we are in February. The river is running fast, but in no danger of flooding, and the catkins are out already on the Hazelnuts. The french for catkin is chaton, the same word as for kitten, and I wonder if catkin is an ancient English word for kitten. On our way down to the restaurant we met our neighbour Jean-Claude and his wife Francoise, and we lunched together. We all had steak and chips. Bon appetit!